3D modeling is growing in popularity, so it makes sense to scan and render buildings in 3D—but what the city-state of Singapore is doing is on another scale entirely. This 3D model project was one of the stars at Bentley’s Year in Infrastructure 2015 conference, taking home the prize in the Innovation in Government category of the Be Inspired Awards. 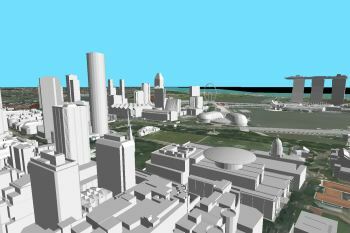 The process of modeling a nation in 3D is similar in many respects to mapping buildings or even cities. 2D and 3D data is captured using various methods of scanning, including oblique imagery, airborne laser scanning, mobile laser scanning and terrestrial scanning. Information is to be updated after the model’s completion using satellite imagery and building information modeling (BIM). 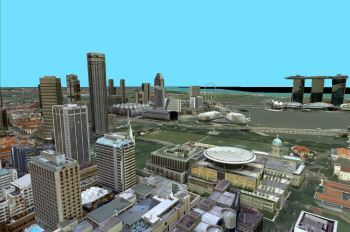 Singapore’s 3D modeling project was created to yield a series of data and datasets to support interoperability between different agencies and software. The model hasn’t been completed yet, but it has already generated more than 50 terabytes of data in multiple formats. Understandably, managing and updating this data is one of the main challenges for this project. These datasets are stored in a single repository and organized using Bentley’s Map software for GIS and mapping. By modeling the entire nation in 3D, the government of Singapore will create a common, collaborative model to unify increasingly popular 3D platforms and prevent inaccuracies. It will support the needs of the government and other agencies in the fields of operation, planning and risk management. The model also has the potential to increase industries in Singapore. The government has listed potential future projects using the model, including an idea for a web-based 3D virtualization of the city to draw attention to the tourism industry and tourist attractions. For more information, please visit the Singapore Land Authority website. *One Singapore dollar is equal to 0.70 U.S. dollars at the time of this writing.